In Stanisław Lem‘s magnificent Solaris, a scientist is being sent to a space station to look into some inexplicable irregularities. Arriving at the station, Kris Kelvin finds a very odd situation in which the other scientists have apparently gone off the rails. Here, the book and the equally magnificent movie adaptation by Andrei Tarkovsky diverge. The movie centers on Kelvin and his reacting to and dealing with the appearance of someone he had not seen in a long time (in the interest of those who haven’t seen it, I will not give away the plot). The book, however, centers more on the probable cause of the disturbances in the space station. It orbits a planet covered by an ocean that appears to be a living creature, a creature that possibly attempts to communicate with the humans in its vicinity. Or maybe not — as Kelvin explores materials compiled by other scientists he attempts to find out. The book is philosophical in a way that a movie could never be. Our own planet isn’t fully covered by water, but there is plenty of it. The oceans — the vast mass of water is divided into separate, yet connected parts — aren’t all that well known to humanity. There are still mysterious creatures being found in their depths. What we know about their top layers mostly revolves around our own activities, whether it’s the steady warming that will make large parts of the planets uninhabitable in a few decades, the overfishing, or the various areas where our garbage has been forming our own uninhabited microcolonies of sorts. But the oceans also form the basis for the hypercapitalist world we live in, where vast amounts of goods are being literally shipped around the world in containers: without this underlying mechanism, the cheap garments made in developing countries (to use that euphemism) would simply disappear from the Walmarts, as would be the sweatshops there, and the argument could probably be extended as to what the consequences might be for the jobs in our midst that have simply disappeared. Unlike Lem’s ocean, our oceans do not appear to have a consciousness of their own. Much like his, however, the patterns that are ingrained onto them clearly speak of a much larger, intelligent system, a system that has profound effects on our lives. 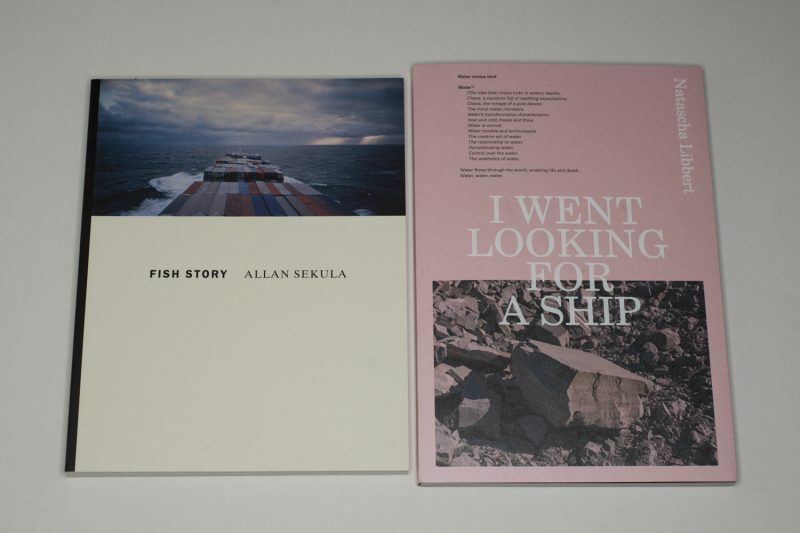 Two recent books deal with exactly this, Allan Sekula‘s Fish Story and Natascha Libbert‘s I Went Looking for a Ship. In both cases, the artists essentially take on the role of Kris Kelvin, attempting to look into the aforementioned patterns. Fish Story is a re-issue of a book that was originally published in the 1990s, while Libbert’s book is brand new. To say that these books are in fact more or less the same is correct in a larger sense: they both attempt to deal with the connection between the larger world of the shipping industry and its connection with capitalism. The strategies the two authors employed to that end differ greatly, though. In Sekula’s case, more than the photographs it is the deeply researched essays that drive the book. You could easily publish just these texts and essentially arrive at more of less the same result. This is an impressive achievement, given that the photographs alone also are of very high quality. In fact, you probably could publish just the photographs on their own to create a book; that book would then follow the lines of contemporary photobook making (it would be a somewhat wishy-washy book that “explores” the topic without the author wanting or being able to be specific — you know the type). But it is the combination of text and images that demonstrates what can be achieved if the two are successfully combined. Libbert employed the same strategy, with text and images being brought together. Unlike in Sekula’s case, the bulk of the text follows the pictures, though. What is more, the visual strategies are more contemporary: where Sekula starts off from the basic conventions of classical documentary photography, the Dutch artist’s approach is clearly much less concerned with individual images, instead embracing variations of the very same picture. The second major difference is the text itself. Sekula’s is academically Marxist, while Libbert’s first-person narrative stays very close to her own photographing and working. I couldn’t say that I would prefer one over the other. Sekula’s dense academic prose resists easy access. It demands to be studied, which in principle is fine. Here and there, however, it is an extremely tedious read. This fact vastly reduces the size of a possible audience: there are only so many people who want to subject themselves to such prose. In contrast, Libbert’s writing is easily accessible and enjoyable to read, without ever reaching any of the depth that Sekula offers. In terms of the pictures, the opposite is the case. Both artists are adept image makers, but I’m thinking that a wider audience might simply be baffled by the repetitions and also by part of the layout employed in I Went Looking for a Ship. Whether or not there is an ideal form for what these two authors attempt to achieve is not clear to me. I might have written this before, but arriving at such an ideal form is probably a lot less important than attempting to get there. This is especially true given that the topic at hand — essentially the form of highly exploitative and toxic global capitalism currently ruling the world — needs to be explored and unmasked before its consequences will make life on this planet impossible. Let’s hope the point of no return has not in fact been reached, yet. One last comment: very large topics are notoriously difficult to deal with photographically. As these two books demonstrate, it can be done. What they make clear is that the role and utility of text should never be neglected, dismissed, or ignored when making a photobook.